Goodyear company is one of the most well-known manufacturers of the finest quality tires for a wide variety of vehicles. If you opt for new tires for your Honda, do yourself and your car a favor, order high-performance Goodyear tires at CARiD and GET up to $160 Goodyear Prepaid Card card by mail-in rebate (available on a purchase of a set of four (4) qualifying Tires). Goodyear has applications to cover any fitment requirements. Don't forget to complete the following PDF form to redeem your card. This exclusive offer is valid until the end of September 2018 only. FOR SALE 17" ASA AR1 BLACK WHEELS W/GOODYEAR EAGLE F1 TIRES!!!!!$700!!! DIRT CHEAP!!! 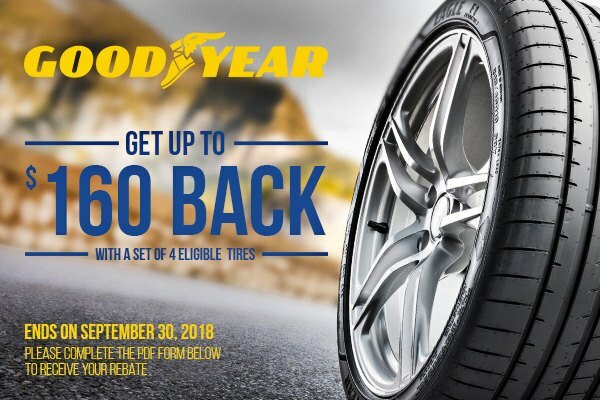 Quick Reply: Goodyear Tires on Sale - Get up to $160 back with the full set purchase!